When the first battle of Coriano was near to an end, Gen. Leese ordered the V Army Corps to advance along the river Conca valley and to take Montescudo (WNW of Croce) . Being the 46th Division bogged down around San Clemente, Gen. Keightley filled the front on the 46th's left flank with the 56th Division (Gen. Whitfield). On September 4, the 167th Brigade of the 56th captured Montefiore Conca. Pursuant Whitfield's initial orders to continue the attack and to take also Gemmano, a platoon was assigned a reconnaissance mission. 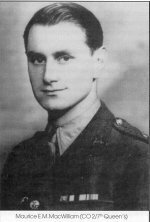 Late in the afternoon, however, Whitfield changed his mind and ordered to forget Gemmano, which that day had been heavily bombed for the first time by guns and aircraft, and move off directly towards Croce. A battalion was left behind "just to clear the hill of the few remaining Germans...". On September 5, while heavy rain had started to fell and dust had turned into mud, fierce attacks and counterattacks continued on the steep slopes around the Villa hamlet. 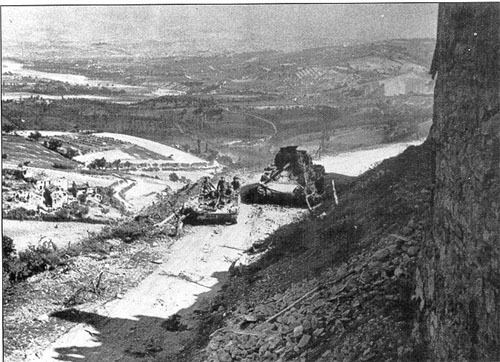 On September 6, having lost quite a few tanks while they were moving along the river Conca valley, the 56th Division Command actually realized how dangerous would have been to leave the German garrison free to fire from the hill at the left flank of the division. Orders for an immediate attack on Gemmano were then given to a tank squadron of the 44th RECCE Regiment.. The tanks had almost reached the top of the hill when the Germans "sturm-gesch�tz" (assault guns) and "panzer-schrecks" (panzer terror) rocket launchers came out from their hide-outs. In a few minutes 14 tanks were hit and set on fire! 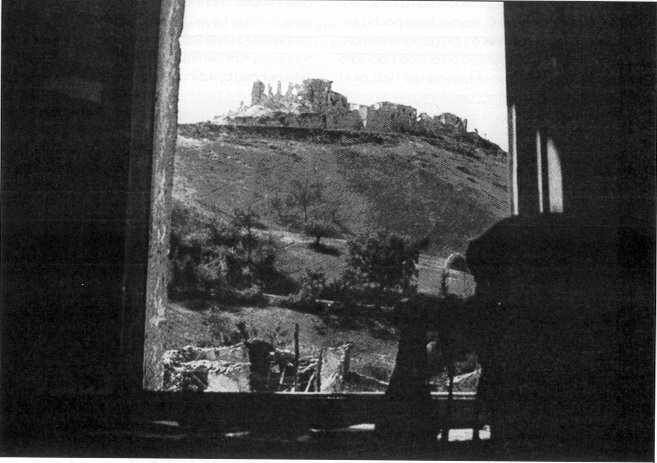 During the afternoon, while it was continuing to rain cats and dogs, the British launched an assault "en masse", supported by a terrific bombardment which completely shattered the church and the houses of Gemmano (as confirmed by the picture herebelow taken from the Villa hamlet), and took several positions near the village from which, however, were repulsed soon after midnight by German counterattacks. The fightings continued throughout the entire September 7. The village and the surrounding salient points (Borgo and Pt. 449) were taken and lost four times by both the two parties. At night the exhausted 7th Oxford & Buckinghamshire Regt. was replaced by the Queen's Brigade (the 169th). It rained heavily all morning on Sept.8, but the rain had stackened when the two assaulting battalions (Queen's Brigade 2/6th and 2/7th under the command of Lt.Col. Renshaw and Maj.MacWilliam, respectively), supported by 4.2-inch mortars, by the medium MG of the 6th Cheshire Rgt., by two squadrons of the 8th RTR, and by the whole of the divisional artillery, moved off towards Gemmano at 2:00pm. On the steep slopes the two battalions lost men fast, under the German MG fire which actually mowed the British troops while they were climbing the hill, in spite of the terrific shelling which, coming from Montefiore Conca, had pulverized the top of the ridge into towering columns of flying earth and stone. and by 8:00pm, after bitter fightings which caused heavy casualties on both sides, the British were rejected from all the positions they had hardly conquered except for two blocks of houses, at the rear edge of the village, garrisoned by a mixed group of men from 'B', 'C', and 'D' Companies of the 2/7th and by few others from the 2/6th battalion, under command of Capt. Rossiter. Meanwhile, about half a mile ahead, the 2/6th was attacking the German positions in the area of the cemetery. A company reached the objective during the afternoon (at what cost ! It took four hours and a number of casualties, including Company's CO (Major Purdon), to cover the 200 yards to the top of Pt.414) but they were actually rejected by the combined fire of German small arms and mortars. During the night, in order to drive back a new British advance which could menace the salient Pt. 449 (Monte Gardo), Ernst was forced to give his artillery the bitter order to open a drumming fire on Gemmano, heedless of the German soldiers and wounded who were there, in the house and in the cellars. In this way, however, he could carry forward his soldiers to make a new defensive line. It was during this action that Lt.Weber and Capt. 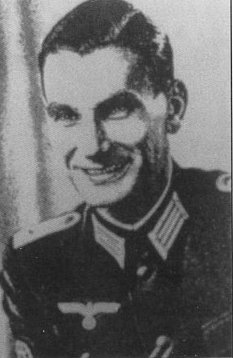 Strohmeyer, COs of the 6th and 7th Company, respectively, were killed. While of Weber all we know is that "...he disappeared during the fightings", we know how Strohmeyer died : "He was wounded in Borgo by the fragments of a shell. He bandaged his wounds with his shirt and sought shelter in the Paesani palace (my family's house! ), but the door was closed (the house was abandoned because my grandparents, my aunt and my 5-year-old cousin were hidden in a refuge). 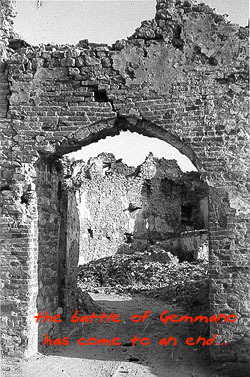 In that moment a shell hit the cornice of the palace which fell down and killed him. His corpse was found months later under the d�bris." At dawn of Sept.9, the 2/7th battalion managed to reinforce Rossiter's garrison. Company 'A', under command of Major Sheppard, entered the village of with little opposition and by 7:00am Gemmano was cleaned up. While MacWilliam's troops were advancing towards Pt.414 and the cemetery, to join with the remnants of the 2/6th battalion, they came under heavy machine-guns and mortars fire and suffered a number of casualties. Gemmano and Borgo, or at least their remains, were finally cleared . All the eastern side of the ridge was in British hands. The Gebirgsjaegers, however, were all but defeated. They still maintained strong defenses on the top of the hill known as Monte Gardo (Pt. 449) and on its bare slopes, overhanging the cemetery and Pt.414, from which they continued to pour a stream of fire over the attackers. As a matter of fact, the Germans were never dislodged from the hill, as they left the position only on Sept. 14, pursuant the orders received to withdraw from Gemmano to Montescudo. A number of casualties was suffered by both sides during the course of the various attacks and counter-attacks bravely conducted, often man-to-man, by the British and by the Germans. Meanwhile, the 2/5th battalion was fighting at Farneto against Capt. Hermann's I Abteilung (for his gallant conduct in this action Hermann won a Ritterkreuz). After two days of bitter fightings, the British assaults were actually rejected on the afternoon of September 10. The Queen's Brigade struggle for the Gemmano ridge was over. 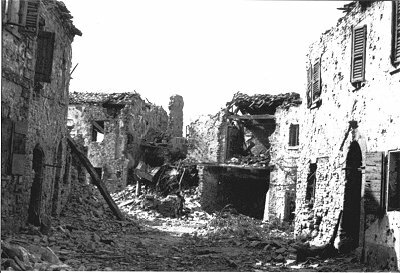 After the capture of the Gemmano village, all the British efforts aimed to dismantle the German defenses were focused on the already mentioned Pt. 449. In view of the heavy casualties suffered by the Queen's Brigade, it was decided to withdraw the 56th Division from the Gemmano sector and to replace it with the 46th Division. The Brig. Harding's 138th Bde was selected as division's spearhead. The 2/4 Battalion of King's Own Yorkshire Light Infantry (KOYLI) Rgt was given the task to attack Pt. 449 from the East, along the Gemmano-Borgo line, while the 6th Lincolnshire and the 6th York & Lancaster were to advance from the SE with the support of the tanks of the Major Preen's 46th Recce . was cleared by an all-day-long shelling and bombing raid (even the Navy took part to the fireworks with its big guns) which battered the German positions but killed also some civilians. On Sept. 11 Gen. Hawkesworth (CO of 46th division) changed his plans. 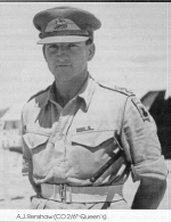 Instead of a front attack to Pt.449, which had proved to be almost impossible and highly "men consuming", he planned to outflank Monte Gardo with a south-eastern advance to the river Conca valley and assigned this task to the 16th Durham Light Infantry (DLI). When this unit reached the area known as "I Tufi" (three houses placed on the Borgo-Monte Gardo ridge, on the slopes descending towards the Conca river), they hit the defensive stronghold set up by the Bachmaier's III Abteilung Gebirgsj�gers. The fightings around the defense system lasted three days and inflicted severe losses to both sides. During this action Ensign Rappel won a Ritterkreuz . 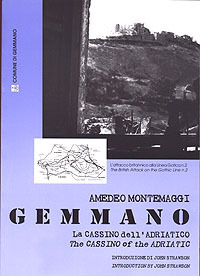 The vain attack to the "I Tufi" position was the last action of 46th Division in the Gemmano sector. On Sept. 13 the division was moved to the other side of the river Conca valley, to the Montescudo-Montecolombo ridge. By September 13, the 4th Indian division was about a mile away from Gemmano ridge. 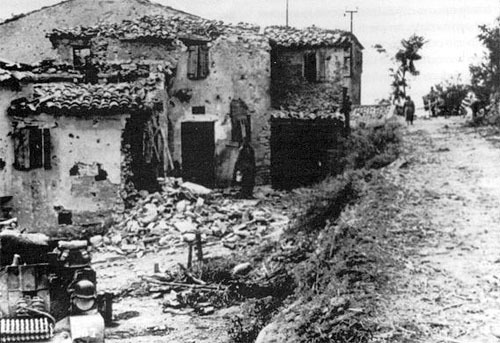 The 46th and 56th divisions had assaulted the ridge eleven times but, albeit they succeded in wiping the Germans out of Gemmano village and from other salient points, had not be able to conquer the bastion of Monte Gardo (Pt. 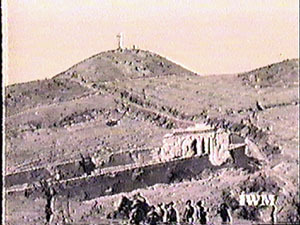 449), with its stark wooden cross overhanging the hill and the villages. The assault was planned to start at 03:00am on September 15 ... but it was too late because at dusk of Sept. 14, Lt.Col. Ernst, pursuant orders received, withdrew from Marazzano to Montescudo and Sassofeltrio. An hour and a half before the attack, however, British guns opened fire, without knowing that only few German rearguards were still in the area. A heavy shelling (more than two thousands rounds were fired on Zollara and surroundings) completely shattered the small village. The Camerons started their attack from the Farneto spur on scheduled time and seven hours later, by 10:12am, after Zollara (capture at 05:30am) they could actually secure Pt.449. The opposition was surprisingly light and caused few casualties, but when the Camerons reached their target, the scene they found on the top of the Monte Gardo was a real nightmare : from the slopes and the hill-top of Pt.449 alone, the Camerons removed 91 British dead.